I have not-so-very-long enjoyed your books tremendously. Living only for a short time in Idaho helps me to appreciate the locale of all your books. I can picture the forest and the trees which are surrounded and filled by your lovable backwoods characters. My husband actually read the book before I did. He said it was your style but . . . different. I anticipated great things and I'm not saying great things weren't found. I suppose it is true that every individual has a variety of character/experiences/art within them. Your art is to write and no doubt you desired to branch out and try new things. That is human nature for which you cannot be faulted. You have given us the character of Bo Tully, a backwoods sheriff who likes to paint. He's a womanizer with manners, as strange as that sounds. Polite to a fault and has your restraint when it comes to applying specific words to trying situations. When faced with multiple murders, he rises to the occasion and solves the mystery in true Blight fashion. He is witty, yes, and also annoyingly disgusting at times. But always in check. You keep your characters in check (which I, again, appreciate). I don't wish to play this book down because I admire your other writings. I would probably read a newly discovered Lucy Maud Montgommery book even if it was hailed a suspense thriller. I would stand by Montgommery's side and public ally applaud her efforts to broaden her horizons. Secretly though I would wish she had never written certain imaginations down on paper. I'd be loyal, but I'd be sad that that was the only manuscript left as yet undiscovered and unpublished. I'd miss the old Lucy. Likewise, I miss the old McManus. Or, perhaps, it is the same McManus as always. Bumbling and lovable and frequently unappreciated for his great skills. So we march along and keep our smiles up knowing that we can always fall back on The Bear in the Attic and other humorous tales of hunting lore and woes. I DO still appreciate your work and the efforts you take to write well. Thank you for your latest installment but if you decide you want to continue to focus solely on making us all laugh, I'll support you! I too have spent time in Idaho (I directed a camp for two summers in Central Idaho). I loved this book--I listened to it on an ipod and found it very funny. 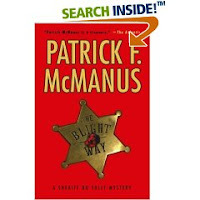 I've read a number of McManus' other books, and this one was different, but it also had plenty of humorous moments in it. Oooh--this reminds me that I want to finish the Fish on the Bicycle, or whatever it is called. I heard about it here. I need to put it on my Semicolon challenge list (I'm still working on it). I've never read anything by Mr. McManus. Should I? Which one to start? Oh ABSOLUTELY! McManus is a breed unto himself and the public is offered the priviledge of enjoying that. Whatever it is. Start with anything. They're all fun!